★★★★★ Awesome. I have used Garmin Fenix 3 HR & Fenix 5. They are great quality fitness watches but are not true smart watches. While the Samsung Galaxy SM-R800 is not up to certain aspects of the Fenix 5 other aspects leave the Fenix 5 in the dust. This is what a smart watch should be. Highly recommended!!! ★★★★★ This might be just another review but this is my first Galaxy Watch and I can say it is awesome. Compared to the Apple watch this is by far better and does a lot more. Would recommend to everyone. This is the 46mm version. ★★★★★ This thing is fantastic. 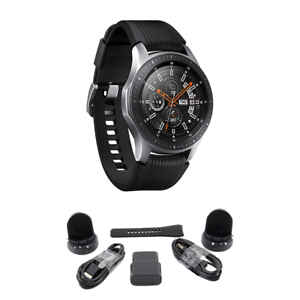 I have three wear OS watches, (the small LG, the original Huawei watch-- which was still my favortie, and a short-lived verizon watch), and the Galaxy Watch is the best. Much brighter screen, Tizen is more intuitive and a better OS, and it is very well put together, There is talk of fewer apps, and with one exception, I haven't noticed. The exception is having a simple alarm clock that allows you to set your own snooze intervals. The one that comes with the watch allows for 5 minutes, and only allows you to snooze three times. terrible. No apps in the samsung store to fix. BUT STILL! I love this watch, and recommend it over the Wear OS watches.